We serve the highest quality premium Japanese black cattle breed. The beef that Misono serves is Kobe beef and Misono Best Quality Beef that are selected from A4 and A5 ranked Japanese black cattle breed. The beautifully marbled sirloin has been always our specialty since the establishment of Misono. It is because that sirloin has the rich flavor and nutrition compared to tenderloin that has less fat. The meat purchasing division at our company has great experiences and has an excellent eye for quality of meat. Please enjoy Misono Best Quality Beef that is selected from the best conditioned beef of the day. 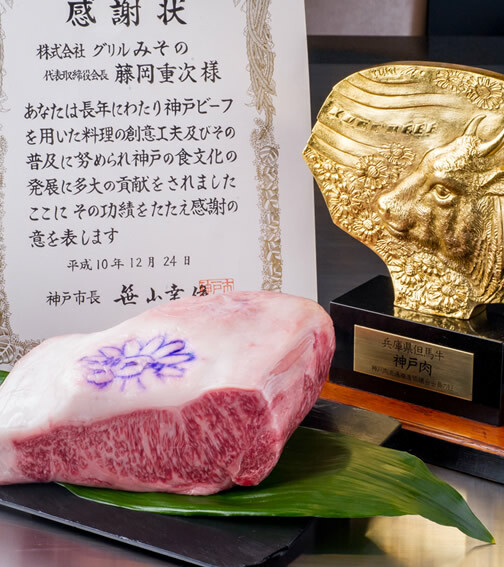 Although beef is generally ranked by the percentage of fat called Sashi, Misono Premium Quality Wagyu is ranked by an original ranking method that is different from the general ranking and has a higher standard. Misono Premium Quality Wagyu needs to be a pure black cattle breed and older than 24 months. The cow should not be raised with any animal feed or growth hormone formulation. The meat has to be gradually aged without being separated from the bones and be officially ranked A4 or A5 by Japan Meat Grading Association. These are minimum qualifications for Misono Premium Quality Wagyu. We directly purchase high quality meat from markets throughout Japan from as far north as Hokkaido and as far south as Kagoshima in addition to the popular places like Tajima, Matsusaka, Miyazaki and Saga. Our skilled staff carefully check the quality and food safety that meet Misno's standard before we serve you. Please enjoy the great taste of the premium black cattle breed that only Misono can offer. Among Tajima beef produced in Hyogo prefecture, only the selective beef that qualifies the most difficult quality standard can be called Kobe beef. The emblems of a chrysanthemum is the proof of the qualification. Only 5,000 cows can be qualified Kobe beef annually. It is only about 0.16% of the entire beef that is consumed and distributed in Japan and very rare. The harmony of lean part with very fine texture and elegant sweet flavor and fatty part with great taste and aroma attracts gourmet celebrities all over the world. The harmony of lean part with very fine texture and elegant sweet flavor and fatty part with great taste and aroma. The secret of the great taste of Kobe beef is the marbling called Shimofuri that is the fat called Sashi spread all over the muscle of the meat like a web. The melting point of the fat is as low as melting with a body temperature. The unique and great taste of Kobe beef is applied to international cuisines. Kobe beef is representing the high class meat of the world. Kobe beef has been given Geographical Indication (GI) Mark as a special agricultural product since December, 2015. Since its establishment, Misono has been always seeking out the style and taste of steak to be loved by Japanese people. In addition to the creative idea of grilling meat on an iron plate, Misono was the first in Japan to serve western style steak with chopsticks, rice in a Japanese rice bowl, and Japanese tea. This style of Misono was praised not only by Japanese but also by foreign customers.